All of the power and features of the R4i Gold 3DS Card - now with a massive 8GB Micro SD Card for the ultimate in storage space for your games, homebrew, applications and more. You'll fit all the games you want on this card, with an 8GB micro SD Card you won't run out of things to do. Fill the card with your favorite homebrew, games and even emulators for all of your classics. The R4i Gold 3DS will also let you watch your favorite and latest movies on your Nintendo DS, DSi, And the Nintendo 3DS system. Put 3 or 4 movies on this 8GB micro SD and you will still have a room for all other types of media. Maybe make some space for your MP3 music, or your favorite ebooks and digital comics too. The possibilities are endless! 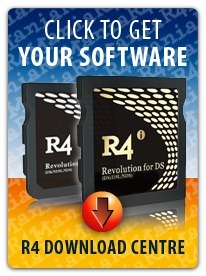 Our R4i Gold 3DS Is Always One Of The Fastest R4 Cards to be updated! Updated on December 6, 2018, Update Includes Full support for the Nintendo 3DS / 3DS XL and Nintendo 2DS and NEW Nintendo 3DS v11.9.0 Update AND The Nintendo DSi and DSi XL 1.45 update! Download the NesDS or SnesDS Emulator and play all of your old school retro games on your Nintendo 3DS system. The R4i Gold 3DS Makes it all possible! 100% compatible with the Nintendo 3DS. Add features and functions that you would never be able to enjoy on your 3ds console alone. Power up your games, movies, music and more. There are free games, apps, and classic game remakes all available from 3ds homebrew sites on line. Hundreds and hundreds of freeware games and apps are just a matter of a click away. Worried that you'll have trouble loading up your card? Don't! With the super easy drag and drop functionality of the R4i Gold 3DS version, you just drag the files, movies, games, etc... you want right on to your micro SD card. Once there, you're ready to play, watch, and enjoy! The super easy graphical user interface for the best experience! 8GB of Storage included with this combo pack for the ultimate in space. You'll have trouble running out of media to fill up this big sized card! 100% compatible with the new Nintendo 3DS system. Make Twitter updates and browse the internet with freeware apps for all of those functions. Play retro games with emulators for NES, Super NES, TG16, Neo Geo, C64 and dozens more! Full multimedia features built right in! 8GB micro SD Card for storing your games, music, movies and more! thanks for the fast shipping for this. I ordered on Monday and got my r4i gold on Friday. I am always worried about ordering online, especially from sites I have never ordered from before but you guys made the experience pain and anxiety free. 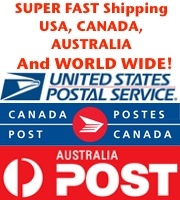 I would highly recommend your site to family and friends and have done so just today. I love this card and the service was fast and helpful. 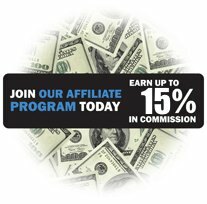 Any questions we had before purchase were swiftly answered and the card works great. Bought on May 25th and receive today, June 8th. 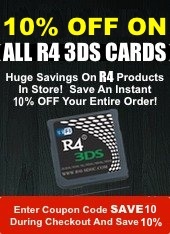 Click the button below to add the R4i Gold 3DS 8GB to your wish list.